When the iPhone debuted in 2007, it was by no means a forgone conclusion that there would ever be an App Store. Steve Jobs reportedly resisted the idea over concerns that it would ‘mess up’ the iPhone,1 yet about one year later, the App Store debuted with around 500 third-party apps. The good news is that change is afoot in the App Store. Last December, Phil Schiller took over responsibility for the App Store. In April, Apple launched a site dedicated to helping developers build their businesses, which includes a way for developers to contact the App Store team directly about promoting their apps. In mid-May, app review times dropped dramatically, from around a week to under two days, instantly changing the launch cycle for developers. Then, just in the last week or two, Apple quietly started hiding Apple TV apps from its Featured pages and top charts that customers have already downloaded, making room to display more new apps. 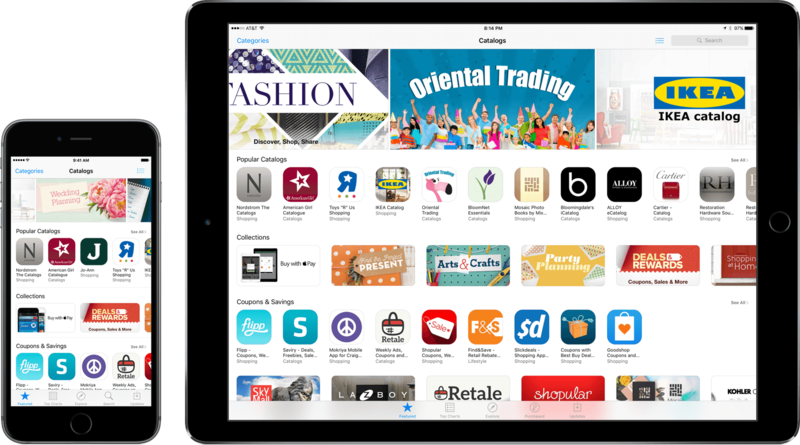 According to rumors Apple has about 100 people working on changes to the App Store. With WWDC just around the corner, I’ve been spending a lot of time thinking about how Apple could improve App Store discovery and gathering ideas from other developers. I’m optimistic that meaningful progress can be made to make developers’ apps more discoverable, but these are hard problems. There is no silver bullet that will improve discovery overnight – it’s a problem that needs to be attacked on multiple fronts simultaneously. The App Store’s Top Free, Paid, and Grossing charts are probably the most effective aspect of the App Store – too effective. Top charts are common to all forms of media, from The New York Times' bestsellers list of books to Billboard’s top ten lists for music. The popularity of top charts is simple: people want to know what other people like. 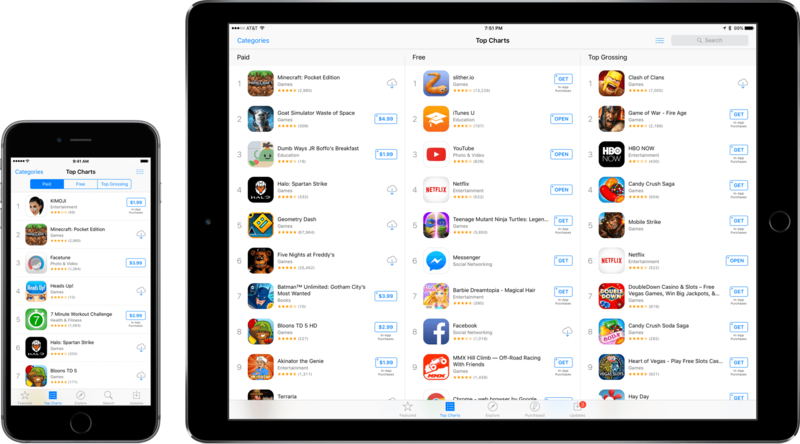 On the App Store, top charts, which exist for the store as a whole and for each category, do just that – they help people discover what is popular. There is very little turnover in the App Store's top charts. Some people have suggested scrapping the top charts. But the popularity of apps like Facebook Messenger and Minecraft aren’t the culprits. The problem is a lack of balance in the App Store and dearth of opportunities for other apps to get in front of potential customers. Attacking the effect won’t solve the problem. Apple needs to tackle the cause – lack of discoverability. If I open the iOS App Store on my iPhone 6s Plus, Apple’s largest iPhone, I can see nine apps on the featured page without scrolling. If I move to the charts, I can see only seven. If I open the App Store on my 15” Retina MacBook Pro, the situation is slightly better – twenty-one apps. My point isn’t to suggest that Apple should cram more apps into each view. Even if it did, that wouldn’t make much difference. The point is that with over 1.5 million iOS apps in the App Store trying to fit more apps onto finite screen real estate is futile. We have to look elsewhere for a solution. Screen limits how many apps can be featured at one time. It should also go without saying, but probably can’t, that app discovery is not Apple’s problem alone. Developers are responsible for marketing their apps. The difficulty with any discussion of App Store discovery is that it often gets caught up and conflated with other pressures facing developers. Yes, it is harder than ever to succeed on the App Store, especially for small teams and solo developers, but if someone still expects to make a living by dropping an app into the enormous sea that is the App Store and walking away, they’re doing it wrong. But, here’s the thing: even after you strip away macroeconomic factors and consider only developers who are working every possible angle to succeed, discovery is still a problem. And just as developers cannot escape responsibility for marketing their apps, Apple can’t escape the fact that App Store discovery is broken. After all, the App Store is Apple’s store. Apple purposefully stands between developers and customers. Whether you like that or not, it’s the deal, but it also implies a responsibility on the part of Apple to developers, especially iOS developers who cannot sell their apps anywhere but the App Store, to create a marketplace that gives developers a fair chance of reaching potential customers. The long term success and viability of the App Store depends on fostering and maintaining app diversity. With the slowing of iPhone sales and Apple’s newfound emphasis on services, we stand at a unique crossroads for the App Store. Now, more than ever, Apple’s interests with respect to the App Store should be aligned with developers’. To better understand what developers want, I got in touch with several to assess ways to improve app discovery in three main areas: search, reviews, and editorial. No matter how big your screen, only a tiny fraction of the apps available on the App Store can be shown at one time. Apple's experiment with hiding apps that someone already owns from Featured pages and top charts on the Apple TV is a step in the right direction and should be rolled out to all its app stores, but the absolute number of apps that can be displayed at one time is still small relative to the entire app catalogue. That makes search critically important. But as Ben Lovejoy of 9to5Mac demonstrated recently with some informal tests, search on the App Store still needs work. He found results for apps like Adobe’s Lightroom littered with deceptive apps that sometimes ranked higher than Lightroom itself, suspect reviews, and other search results that included highly-ranked apps with no reviews or ratings at all. Nonetheless, search has improved. In 2014, Ged Maheux wrote about his search for 'twitter' on the App Store, which returned just a handful of Twitter clients. Twitterrific, made by Ged’s company, The Iconfactory, was ranked at #100 at the time, despite being on the App Store from the beginning. Searches like Ged's work much better now. As I write this, Twitterrific is the fourth result if you search for 'twitter.' The search results also include many other relevant results, but still return games, alarm clock apps, and other irrelevant results. In my own experience, I have found that search results are also often inconsistent between platforms. The results returned for an app search in iTunes are often different than the results I get from the App Store on iOS, which are both different than the results returned by the iTunes Search API,3 which are oftentimes the worst of all. In short, App Store search results have two main problems – relevance and consistency. So what's going on and how can it be fixed? Apple is upfront in its developer documentation that apps are searchable by app name, keywords, and your company name only. What is left unstated is how search results are ranked. One problem is App Store Optimization, or 'ASO.' ASO has become big business, but there's a difference between a well-chosen app name and keywords that enhance the chance that someone will discover a relevant app through search, and gaming the system. Too often ASO results in app names and keywords stuffed full of irrelevant terms that skew search results. Admittedly, fighting this sort of battle is an arms race that can never be truly won, but Apple holds an advantage that search engines like Google don't have on the web – it controls the App Store, the developer program, and everything in between. Title and keyword abuse is already supposed to be addressed as part of the app review process, but it doesn’t seem to be working because blatant keyword stuffing is widespread. The first line of defense against this sort of practice has to be increased human intervention by App Review. Not every case of improper ASO can be detected algorithmically. Someone reviewing an app needs to look at the title and the keywords to determine whether they are appropriate. It’s a subjective determination, but much of App Review is. Whether the app has been featured in the past. Reaching beyond the boundaries of the App Store, Apple should also consider deals with companies like Facebook or Twitter for data about which apps are being shared. Even in an anonymized, aggregated form, that data when combined with Apple’s could help it validate search rankings. The App Store's ability to filter search results should also be expanded. This is something that Amazon does particularly well. If I run a search and it returns thousands of results, I can narrow the search by criteria like price, color, and rating. The App Store allows some filtering on the iPad and in iTunes, but not on the iPhone. One obvious solution would be to expand filtering to the iPhone version of the App Store and add more filters on all platforms. The beauty of a robust filtering system is that the filters applied by customers demonstrate an intent that can be used to make the initial, unfiltered search results better, creating a virtuous cycle that improves search ranking across the board. Ratings and reviews are part of app discovery. Especially if you are searching for a type of app instead of a particular app, the only information you have to go on (other than what is provided by the developer) is the ratings and reviews of other users. As a result, ratings and reviews can make or break a purchasing decision. Ratings are important because they show up in more places than reviews. Run an App Store search on an iOS device and the ratings are right there next to the icon in the search results. They also show up on the main detail page for an app, while reviews remain hidden behind a tab. The App Store on iOS collapses ratings and reviews into one view. 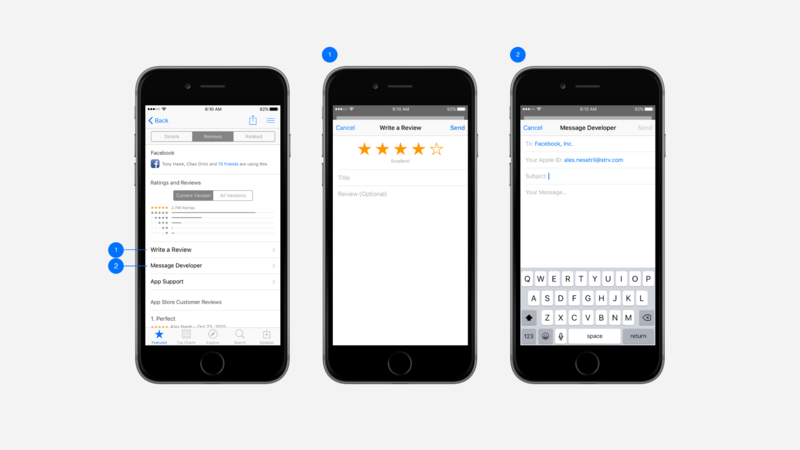 You can leave a rating without leaving a review, but to do so you have to first tap the ‘Write a Review’ button. The prospect of having to write a review instead of leaving a star rating undoubtedly prevents many ratings from being left by users. The problem is compounded by the fact that ratings and reviews disappear each time a developer updates an app. Average users don’t know this; to them, the app looks like one that no one has ever bothered to rate. Another effect of disappearing reviews is the endless parade of developers begging for them. That’s not a great experience for customers, but developers wouldn’t do it if reviews didn’t have an impact on sales. Readdle, the maker of PDF Expert, Spark, and other apps reports that it sometimes sees a 30-40% dip in sales when an update resets reviews. That’s a steep price to pay for an app update. Resetting reviews slows the update cycle because the more frequently a developer releases updates, the more often their app has no visible reviews. The only way to deal with this is to update less frequently. Presumably, one purpose of the recent dramatic reduction in app review times is to encourage developers to update their apps more often. That’s a worthy goal, but the effect is likely to be muted until there’s a solution to disappearing reviews. Of course, it’s not quite right to say that the reviews just disappear when an app is updated. You can still find reviews if you dig into the ‘All Versions’ tab of the reviews section, but they're too deeply buried. The average ratings for all versions should be promoted and displayed next to the rating for the current version. That may introduce some potential confusion, but if the ratings are clearly labeled, that risk strikes me as a small in relation to the cost of burying months or years of developers’ hard-won reviews. Almost 18,000 reviews with a 4.5 star average rating hidden. Another problem with reviews is that the thoughtful, useful ones don't always float to the top. This too is a solved problem. Sites like Quora and StackOverflow do a good job of filtering out junk answers to questions that don't add any valuable insight with voting systems. The systems are not perfect, but in most cases the best answers tend to rise to the top. The same sort of system could help elevate useful app reviews. Apple has a system for marking reviews as helpful or not, but it's only in iTunes at the bottom of each review. I suspect that most people browse the App Store on their iPhones and iPads, not their Macs or PCs. The iTunes implementation also feels somewhat half-hearted. Voting buttons should be more prominent and at the top of a review where they cannot be missed by users. Perhaps worst of all, though, is the inability for developers to effectively address unfair and misinformed reviews. There needs to be greater accountability on the part of users and recourse for developers to deal with unfair reviews. First, users should be encouraged to leave reviews under their real names by making that the default option. Anonymous reviews tend to lead to exaggerated reviews. Encouraging people to use their real names should make a difference in the quality of reviews. Second, users and developers should be able to contact one another in a controlled, private, and moderated environment. I get that Apple views app buyers as its customers and wants to control the App Store experience, but if a customer is having a problem with a third-party app, there needs to be a way to address the problem short of users resorting to leaving bug reports as one-star reviews. An unhappy user should have a chance to contact the developer of an app, even if only on an anonymous basis. One proposal I like a lot is from Ales Nesetril who suggests giving users an opportunity to contact the developer when they try to rate an app less than three stars by displaying an alert view that gives the user the option to leave a review, contact the developer, or cancel. Nesetril also suggests adding a ‘Message Developer’ or ‘Bug Report’ button that pulls up a draft email to the developer right below the ‘Write a Review’ button. Again, this could be anonymized. Ales Nesetril's concept for contacting developers from the App Store. Likewise, developers should be given the opportunity to respond to reviews. It’s incredibly frustrating for developers to see reviews where a user has a solvable problem that results in a poor review that could have been avoided if developers could contact users. Allowing this interaction could be messy, but on balance, I expect the vast majority of developers would handle the situation well. After all, developers want users to be happy. It’s perplexing to me why this doesn’t exist already, other than perhaps the notion that users are Apple’s customers and not developers’. I understand that perspective, but it doesn’t fit well with reality. Apple isn't equipped to address the problems that App Store customers have with third-party apps and, as the recipient of 70% of every sale, developers have every incentive to try to make users happy. The Google Play Store has permitted developers to answer reviews for a long time now and I’ve seen no indication that it has harmed Android. It is time to treat developers like grown-ups and let them address customers directly. Apple's editorial team does a good job putting together app collections that surface high-quality apps that might not get a lot of attention otherwise, but it suffers from some of the same constraints as the rest of the App Store. The App Store is just too big for Apple's editorial team to cover it all effectively. The App Store Featured section. In addition, developers I've spoken to say that while it's great to get featured on the App Store, the impact on sales isn't what it used to be. Soon after the feature is over, sales return to pre-feature levels. One simple way to extend the life of the editorial team's feature work and its impact on developers' apps would be to badge apps that have been featured. Apps featured as Editors' Choices and Essentials already include this sort of badging, so why not extend the concept to other featured apps with something like a 'Featured' badge? Apple has promoted music using things like celebrity playlists since before there was an App Store. That has expanded to music collections tied to other media outlets. For instance, the iTunes Music Store recently promoted music from artists that appeared on the Today Show's outdoor concert series and hand-picked selections from music websites like Pitchfork. Apple Music already features third-party recommendations. The same sort of cross-media promotion could be applied to the App Store. Why not feature the favorite apps of celebrities, websites, or even individual writers who cover apps? I know that after reading Federico's article about his must-have apps of 2015, I would have liked to go to a dedicated page on the App Store to browse the apps he covered. By curating third-party collaborations, Apple editorial could retain control of the quality and presentation of collections, but also lighten their own load by outsourcing the app picking process. I would go one step further, though. For approved sites that cover apps, why not link back to the reviews that cover those apps and allow the sites to earn affiliate commissions on the sales? I recognize that as a writer for the type of site I'm imagining, I'm not disinterested here, but it strikes me that this sort of thing already works well on the other end of the link. Sites like MacStories already send readers to the App Store thousands of times a day. MacStories' reputation rides on making honest, quality recommendations to readers, which is not unique to us. Why not also send readers back to the site if they start in the App Store and wonder what MacStories or another site has to say about an app they are considering purchasing? Apple's insistence on controlling its customers' experience makes me skeptical that it would consider bringing third parties into the curation process, but it should. This is precisely the sort of situation that plays to the strengths of crowdsourcing, especially if Apple creates incentives for third parties such as links back to websites and integration with the iTunes Affiliate Program. Apple isn’t doing enough to leverage the popularity of the iPhone to help its other platforms. The iPhone is unique in that it is a device that is with you all day long. I use it to rent movies to watch later at home on my Apple TV, buy iBooks that I will read on my iPad at home, and buy things from Amazon and other retailers that will be delivered to my home later. My point is that I use my iPhone all the time to buy things that I won’t use on that device. So why can’t I buy iPad-only, Mac, or Apple TV apps on my iPhone? Sure, there’s a user experience and design challenge here. You have to be certain that the purchaser has the right hardware and intends to buy something to use on those other platforms, but that is solvable. After all, Apple knows what devices are tied to your Apple ID. Why can't I buy Mac apps on iOS or iPad apps on the iPhone? It happens to me all the time. I'm reading on my iPhone while commuting to or from work and I come across a link to an iPad or Mac app I want to check out. I tap the link and get a message that the app I want to check out 'is only available on iPad' or 'is only available on OS X’. Not only can I not buy the app, but I can’t even read the developer’s app description, browse its reviews, or look at its screenshots. iPad-only apps should be available on the iPhone's App Store and Mac apps should be first-class App Store citizens. I know this means further crowding an already packed store, but the moment that an App Store link is tapped is the moment that there’s an opportunity to sell the app. Throwing up an alert and hoping someone will search for the app again when they are in front of an iPad or Mac is asking too much. The problem is even worse on the Apple TV App Store. Apple TV apps are a strange beast. You can bundle them with an iOS app or sell them as standalone apps. The advantage of bundling an Apple TV app with an iOS app is discoverability. If someone buys your app on the iOS App Store, it will automatically show up in the 'Purchased' section of the Apple TV App Store. The downside of tying an Apple TV app to an iOS app is that the developer forgoes the revenue that could be earned by selling the app separately. The biggest problem with selling Apple TV apps is that there's no way for developers or sites like MacStories to link people to a store where they can buy an Apple TV app. Recently, Apple added preview pages that you can link to that provide the same basic information included on the Apple TV App Store, but there is still no way to buy the app, except through the App Store app on an Apple TV. Developers and sites alike are left asking people to use Apple TV's search functionality to find apps, which has the same challenges that the iOS App Store has. Until Apple TV apps can be purchased outside the Apple TV App Store, I don't see standalone Apple TV apps getting much traction – they are just too hard to buy. Apple should allow Apple TV (and Mac) apps to be purchased through the iOS App Store. That way, if I'm sitting on the train on a Friday evening heading home trying to come up with something to do with my family and think of a game like SketchParty TV, I could buy it and have it ready to go as soon as I get home. I would also like to see Apple take advantage of technologies like Handoff, location services, and deep linking on the iPhone to alert users that an app they are using is available on the Apple TV and offer to download and open it. Imagine using a TV network's app on your iPhone on the way home from somewhere. You get home, turn on your Apple TV, and it offers to download the Apple TV version of the network's app and pick up where you left off. Finally, I would also like to see app bundles made cross-platform. App bundles have their own set of problems that are beyond the scope of this article, but they have the potential to be a useful marketing tool for developers that have multiple apps that work together well. 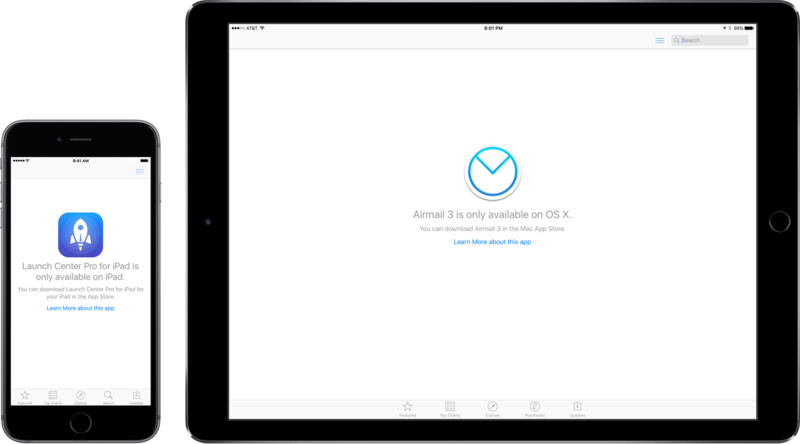 Some of my favorite apps like 2Do, Ulysses, and Airmail offer powerful Mac and iOS versions of their apps. The developers that make those apps should be able to offer the iOS and Mac versions of those apps to users at a discount if they think it would help sell more copies of their apps. The rumor that Apple has 100 people working on App Store search doesn’t surprise me. Discovery is a big problem that has gotten away from Apple in the wake of the App Store’s rapid growth. But I’m also optimistic. 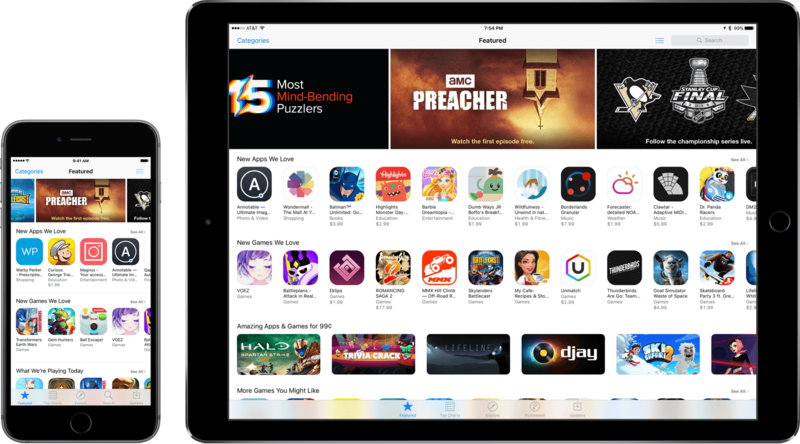 Apple has already shown a renewed focus on the App Store, including the dramatic reduction in App Review times. Moreover, many of the issues that the App Store faces are problems that have been solved by others and can be attacked on many fronts at once. I don’t know what we’ll see at WWDC, but the possibility that big changes to the App Store may be around the corner are the sort of thing that gets me excited for the keynote on June 13th.